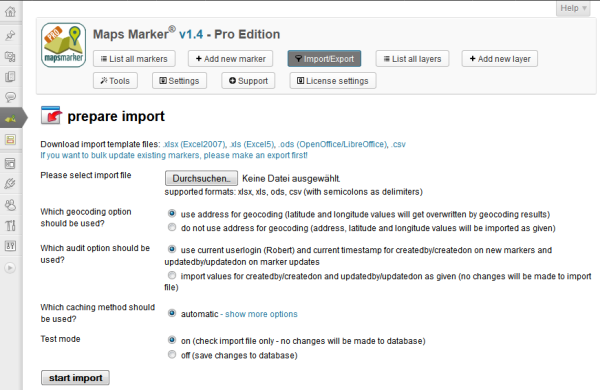 I am glad to announce a major milestone in the development of Leaflet Maps Marker Pro: v1.4 now finally supports CSV/XLS/XLSX/ODS exports and imports for bulk additions and bulk updates of markers. This feature has been asked for a long time and it took me a while to find the right approach for delivering a usable and technologically found solution. The import and export functionality is based on PHPExcel, which is a solid framework for reading and writing spreadsheets via PHP. Let me know what you think about this new feature by submitting a review! No more need to do hundreds of clicks when you want to add for example 100 markers manually. 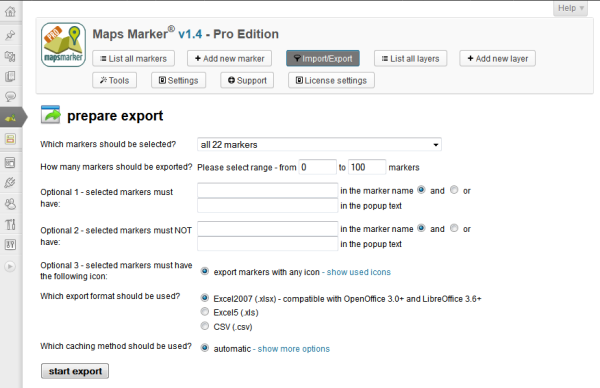 With the import feature you can easily fill out an Excel table for example and let the pro plugin do the rest for you. If you want to contribute to translations (Thai would be great 😉 ), please visit http://translate.mapsmarker.com/projects/lmm for more information. Please note that translators are also compensated for their contribution – for example if a translation is finished less than 50%, the translator gets a free 25 licenses pack worth €199 as a compensation for completing the translation to 100%. As leaflet.js v0.7 will be released soon, this will also be the focus of the next pro release. I am also already trying to find the best way how to add filtering on frontend, as this is one of the most asked for features currently.